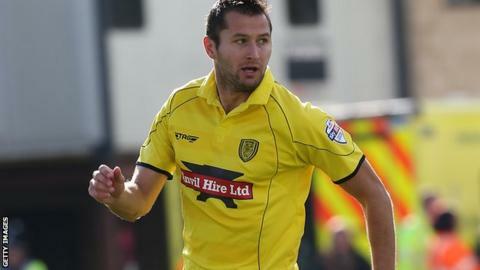 Burton Albion ended Luton Town's 11-game unbeaten league run with a hard-fought win at the Pirelli Stadium. Luke Guttridge had the best chance of a quiet first-half but his low driven effort was well saved by Brewers goalkeeper Jon McLaughlin. Phil Edwards headed Burton into the lead shortly after half-time from a corner by Matty Palmer. Hatters defender Luke Wilkinson was sent-off late on for a foul on Palmer as Burton held on for the victory. Burton move up into the automatic promotion places following their second consecutive win under new manager Jimmy Floyd Hasselbaink, while Luton, who suffered their first league defeat since 6 September, drop from first to third. "I thought for the away team we did more than enough to win the game. We didn't due to final ball not always being the best, good defending, and good goalkeeping. "It was a really good performance. We don't concede from restarts but we did today. Performance-wise, I was pleased with our performance. "They've won and good luck to them, but they've got more to look at than perhaps we've got to look at." Match ends, Burton Albion 1, Luton Town 0. Second Half ends, Burton Albion 1, Luton Town 0. Substitution, Burton Albion. Lee Bell replaces Matthew Palmer. Foul by George Taft (Burton Albion). Ricky Miller (Luton Town) wins a free kick on the right wing. Corner, Luton Town. Conceded by John Mousinho. Corner, Luton Town. Conceded by Damien McCrory. Attempt blocked. Shaun Whalley (Luton Town) right footed shot from outside the box is blocked. Substitution, Burton Albion. Liam Slade replaces Alexander MacDonald. Steve McNulty (Luton Town) wins a free kick on the left wing. Attempt missed. Ricky Miller (Luton Town) right footed shot from the centre of the box is close, but misses to the right. Corner, Luton Town. Conceded by Jon McLaughlin. Attempt saved. Paul Benson (Luton Town) right footed shot from the centre of the box is saved in the bottom right corner. Corner, Luton Town. Conceded by Philip Edwards. Substitution, Burton Albion. Bryn Morris replaces Adam McGurk. Substitution, Luton Town. Andy Drury replaces Nathan Doyle. Robbie Weir (Burton Albion) is shown the yellow card. Ricky Miller (Luton Town) wins a free kick in the defensive half. Attempt missed. Jonathan Smith (Luton Town) right footed shot from outside the box is close, but misses to the right. Substitution, Luton Town. Ricky Miller replaces Luke Guttridge. Attempt missed. Nathan Doyle (Luton Town) right footed shot from outside the box is too high. Attempt blocked. Alexander MacDonald (Burton Albion) left footed shot from outside the box is blocked. Substitution, Luton Town. Pelly Ruddock replaces Jake Howells.